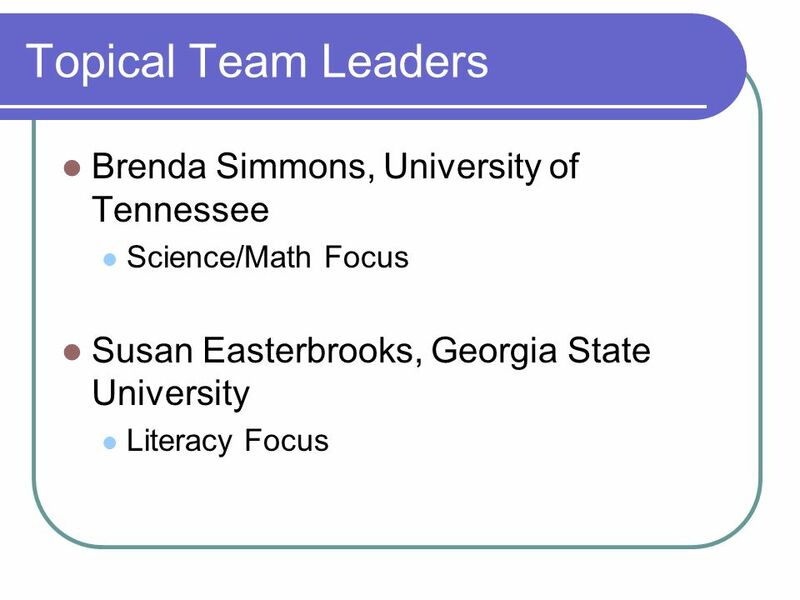 Topical Team 2.2 Academic Content and Content Best Practices October 25 and 27, 2004 Brenda Simmons, University of Tennessee. 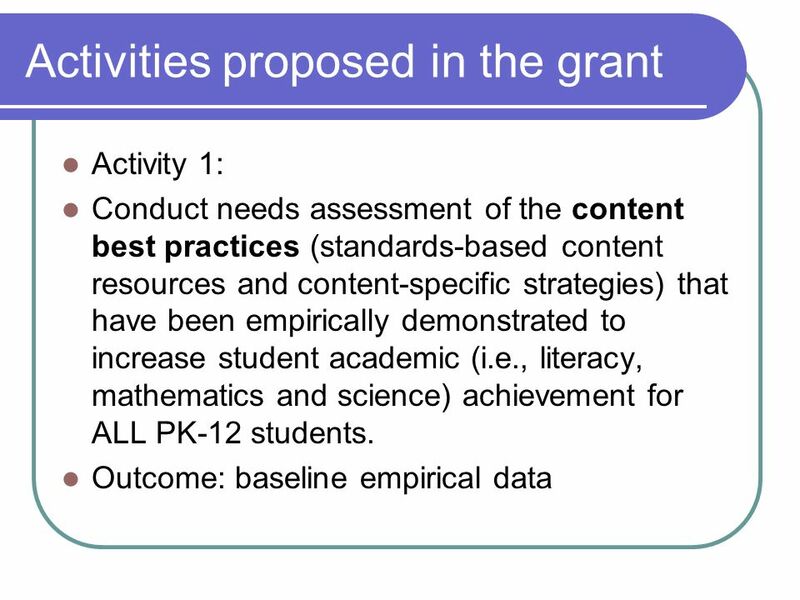 4 Overall Outcomes Expected for Grant Period Research supporting increased academic achievement as a result of using the most effective standards-based content resources and content-specific strategies for teaching academic content to PK-12 students who are d/hh, improving d/hh teacher preparation program designs and increasing d/hh preservice teachers abilities to demonstrate content best practices competence. 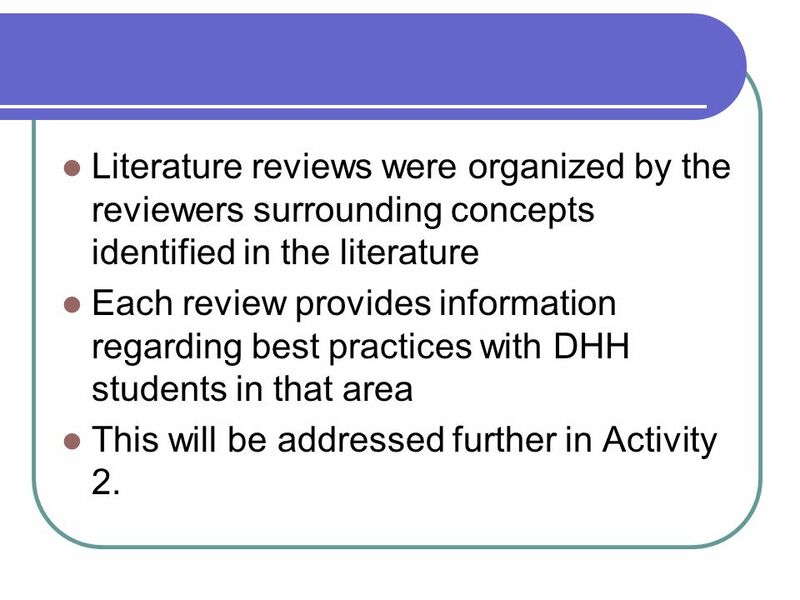 8 Literature reviews were organized by the reviewers surrounding concepts identified in the literature Each review provides information regarding best practices with DHH students in that area This will be addressed further in Activity 2. 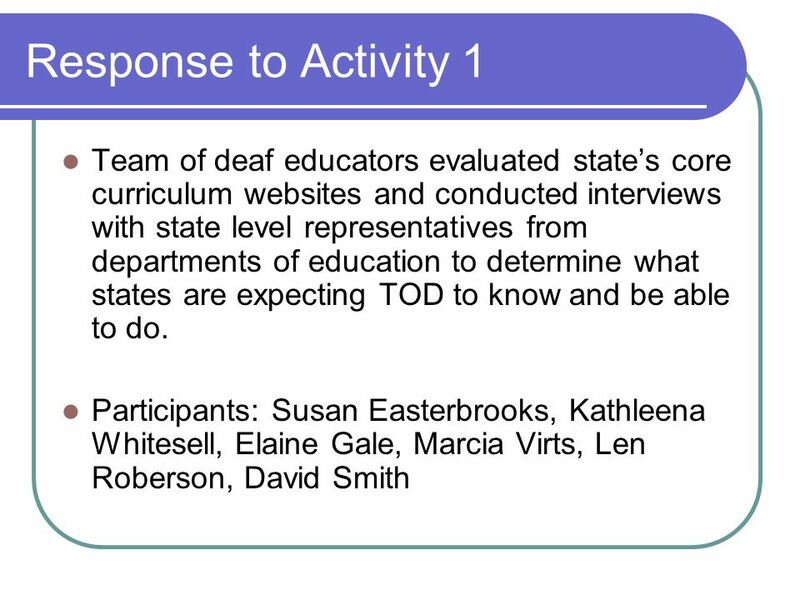 11 Posed following questions to Department of Ed officials How does the state require teachers of the deaf/hard of hearing to respond to the general education curriculum? 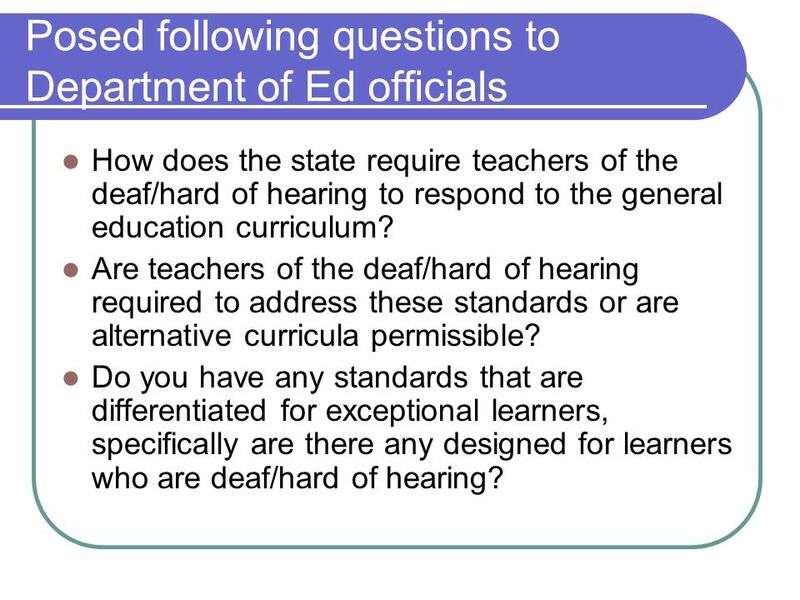 Are teachers of the deaf/hard of hearing required to address these standards or are alternative curricula permissible? 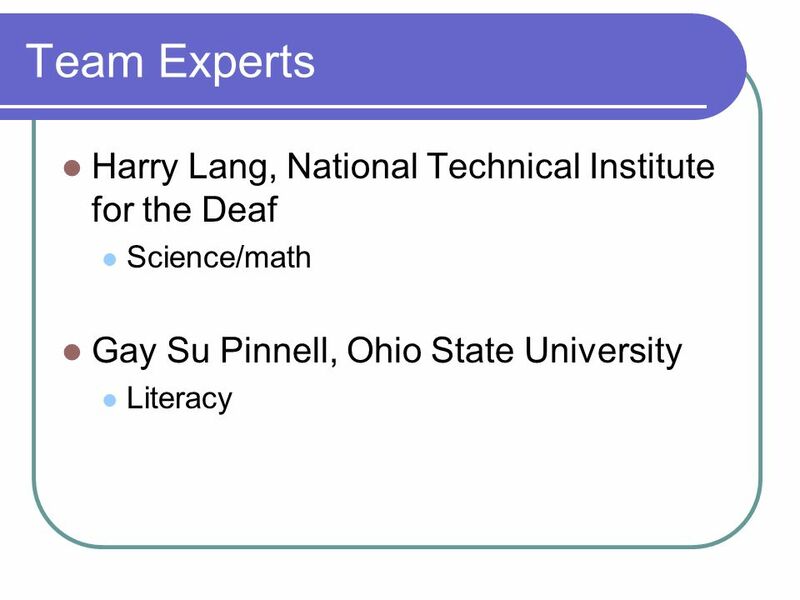 Do you have any standards that are differentiated for exceptional learners, specifically are there any designed for learners who are deaf/hard of hearing? 12 What resources are available on the website to assist teacher? 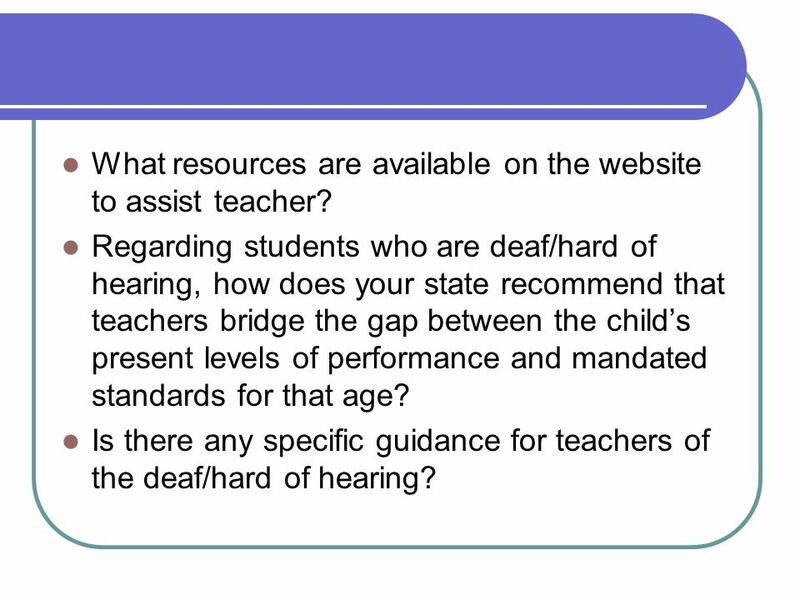 Regarding students who are deaf/hard of hearing, how does your state recommend that teachers bridge the gap between the childs present levels of performance and mandated standards for that age? 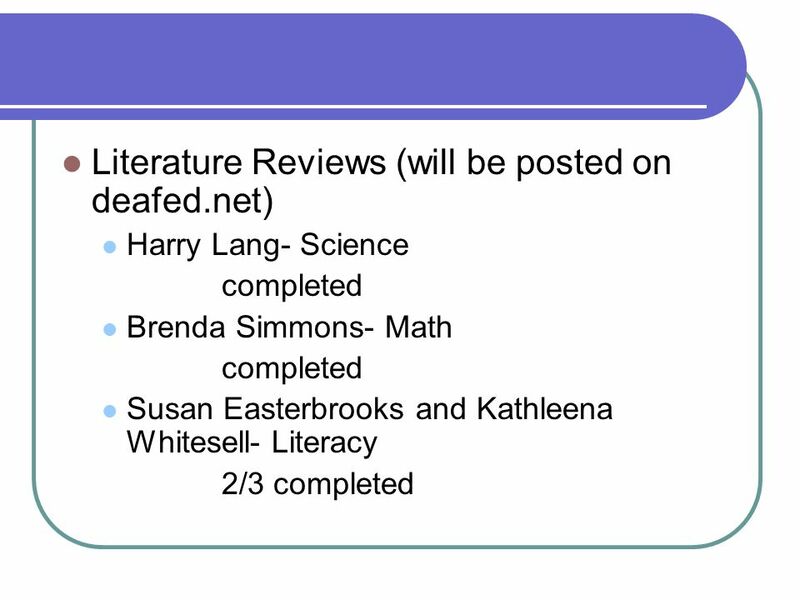 Is there any specific guidance for teachers of the deaf/hard of hearing? 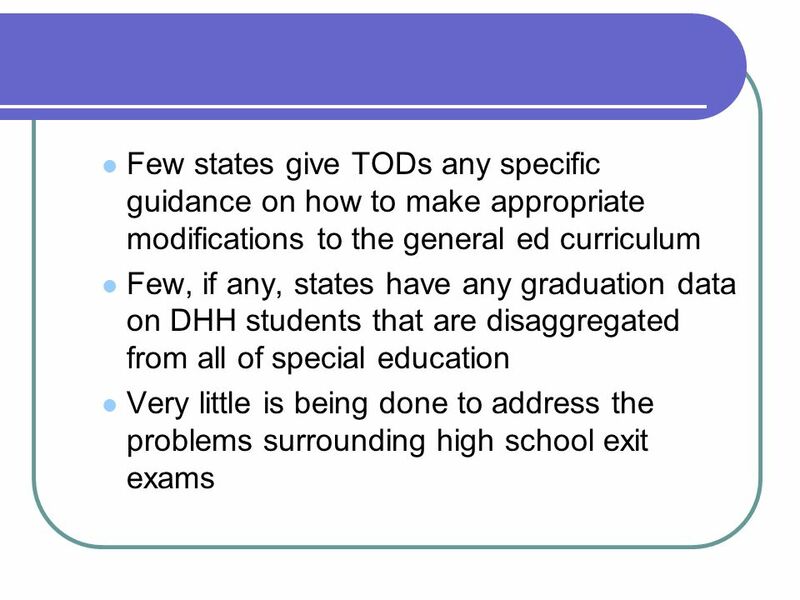 13 Do deaf/hard of hearing students need to pass exit exams to get a regular diploma? 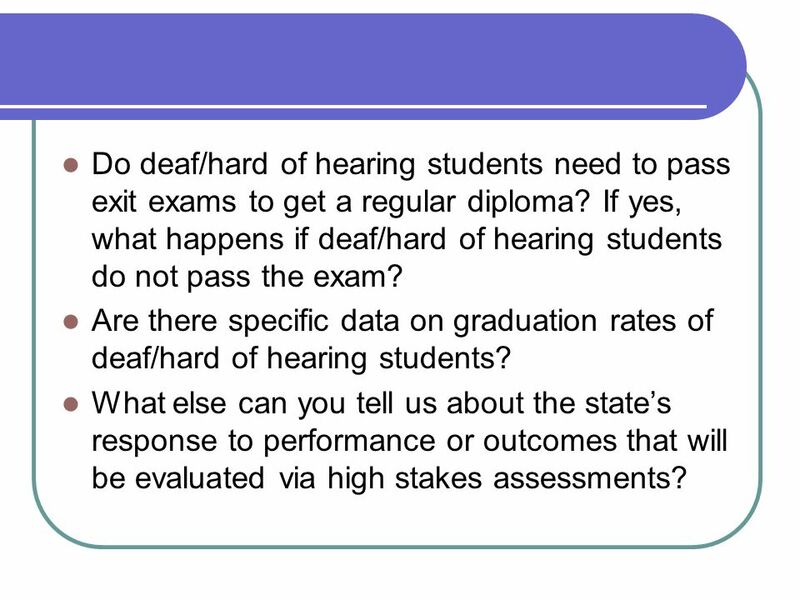 If yes, what happens if deaf/hard of hearing students do not pass the exam? 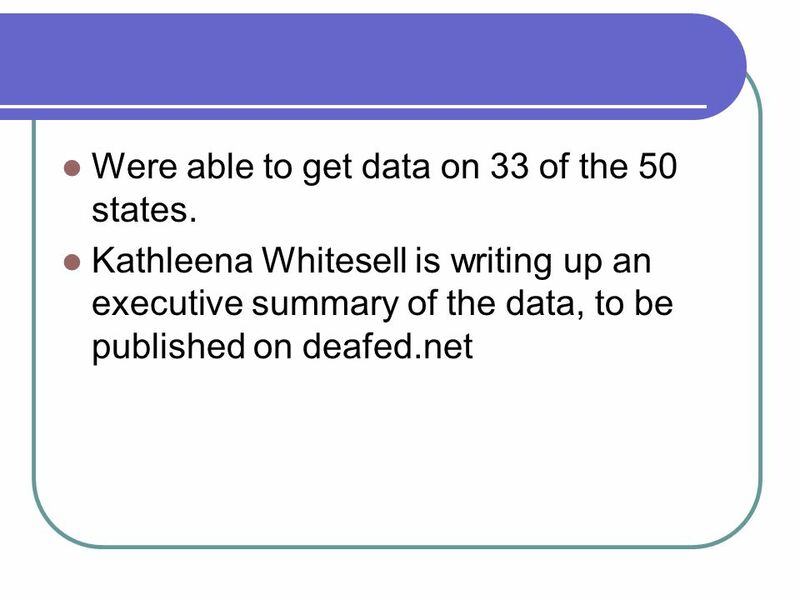 Are there specific data on graduation rates of deaf/hard of hearing students? 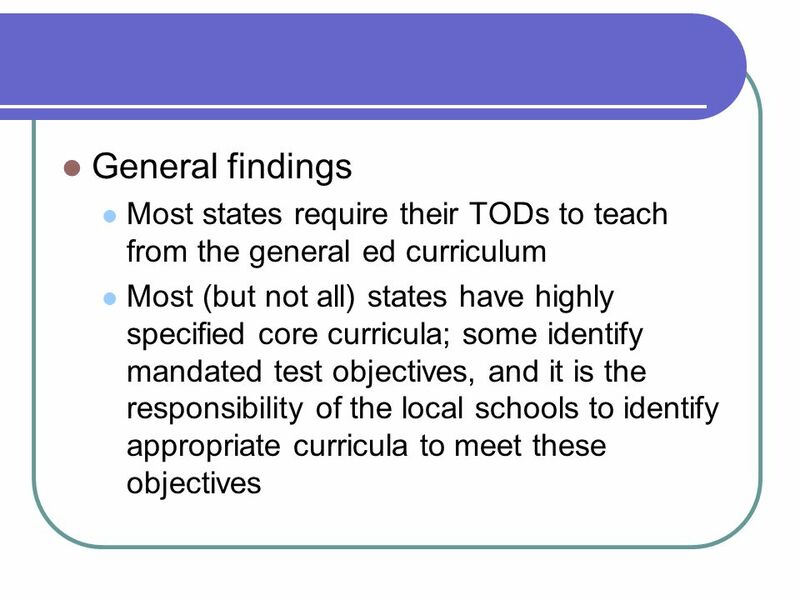 What else can you tell us about the states response to performance or outcomes that will be evaluated via high stakes assessments? 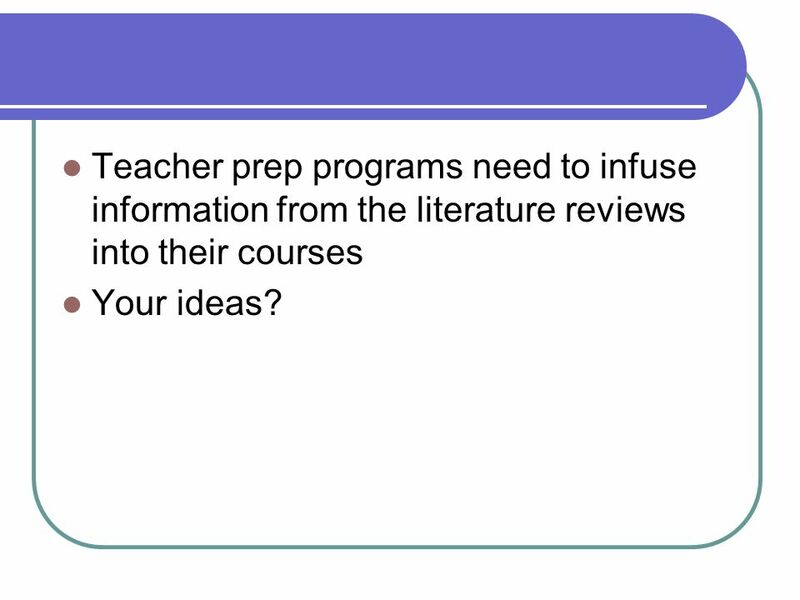 19 Teacher prep programs need to infuse information from the literature reviews into their courses Your ideas? 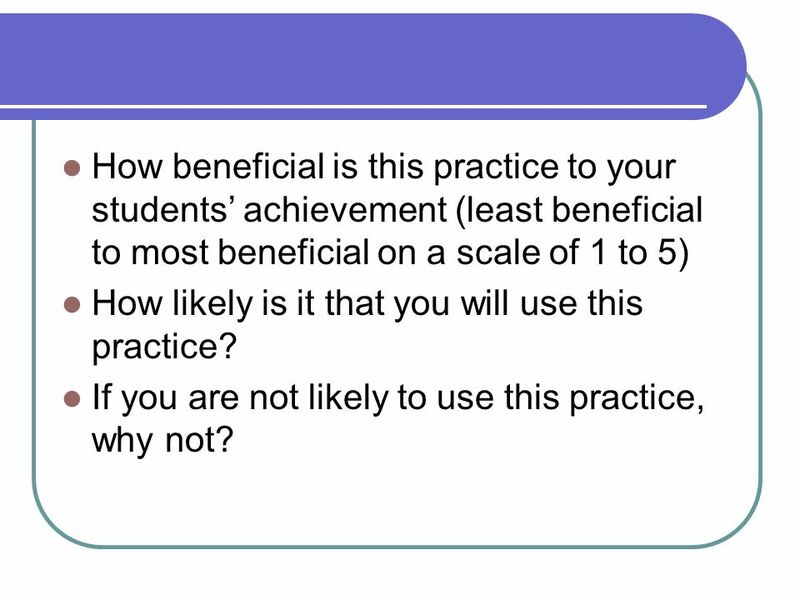 22 How beneficial is this practice to your students achievement (least beneficial to most beneficial on a scale of 1 to 5) How likely is it that you will use this practice? If you are not likely to use this practice, why not? 23 Donna Mertens will place the survey on the Gallaudet website using Perseus Software Result will be an analysis of what works and what teachers will in reality do. 24 How can others help? 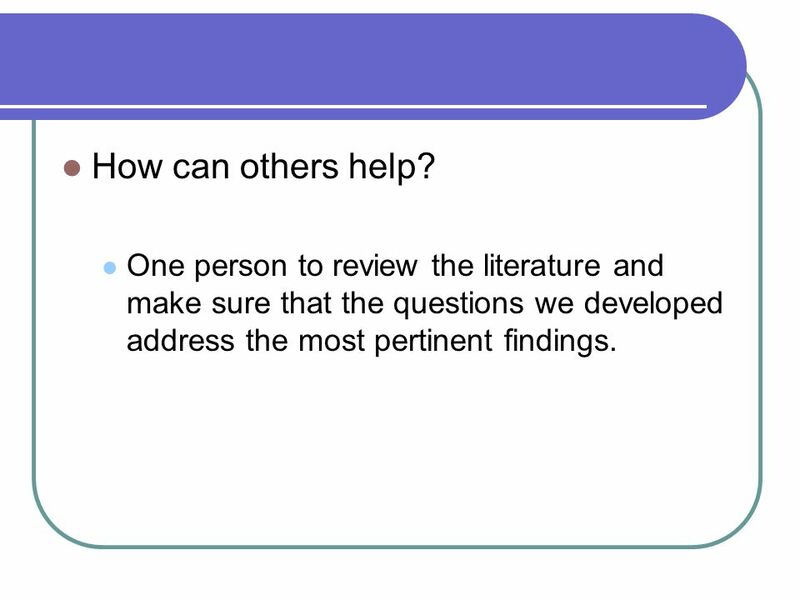 One person to review the literature and make sure that the questions we developed address the most pertinent findings. 25 Activity 3 Disseminate resulting research and offer professional development support for the use of the research information to DHH preservice teachers, their faculty, MT and the entire CoP. 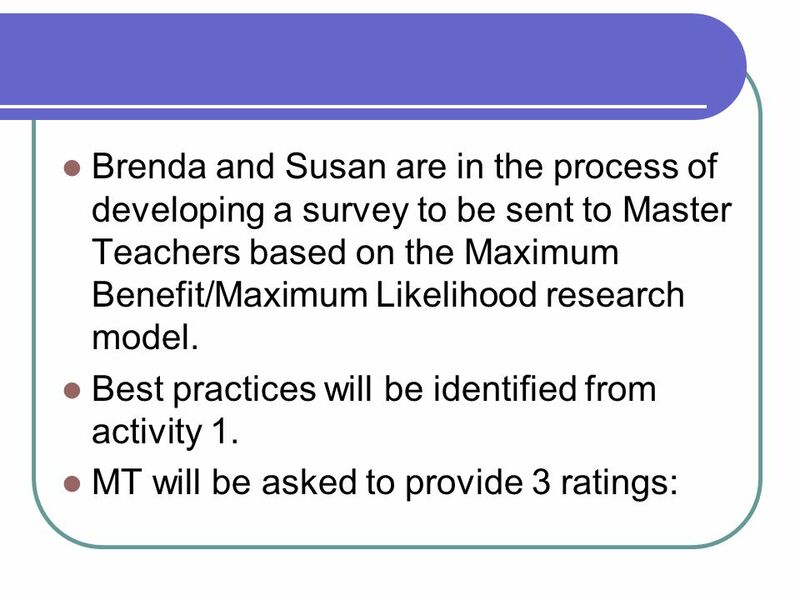 Outcome: Increase in knowledge base and use of content best practices by DHH preservice teachers, their faculty and MT. 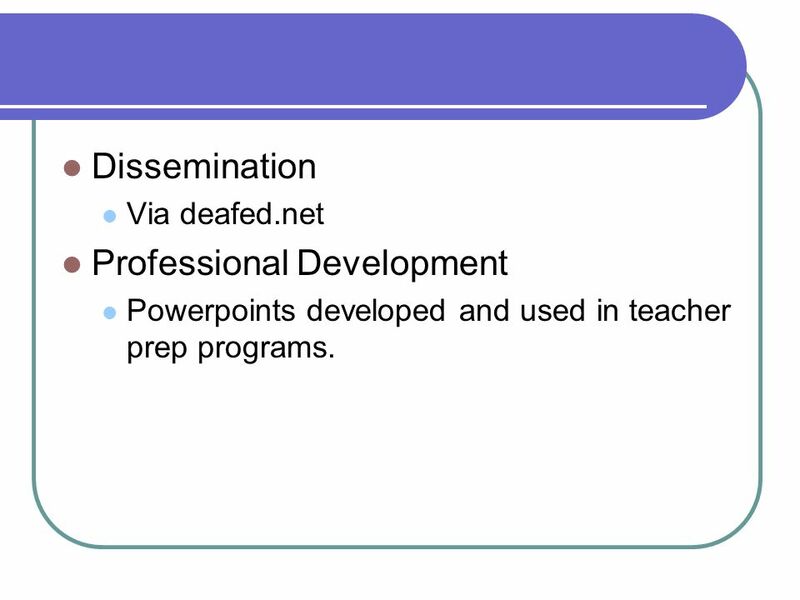 26 Dissemination Via deafed.net Professional Development Powerpoints developed and used in teacher prep programs. 28 Activity 4 Conduct follow-up research on the impact of the disseminated information on DHH teacher preparation programs and their preservice teachers demonstrations of content best practices competence. Outcome: Empirical evidence. 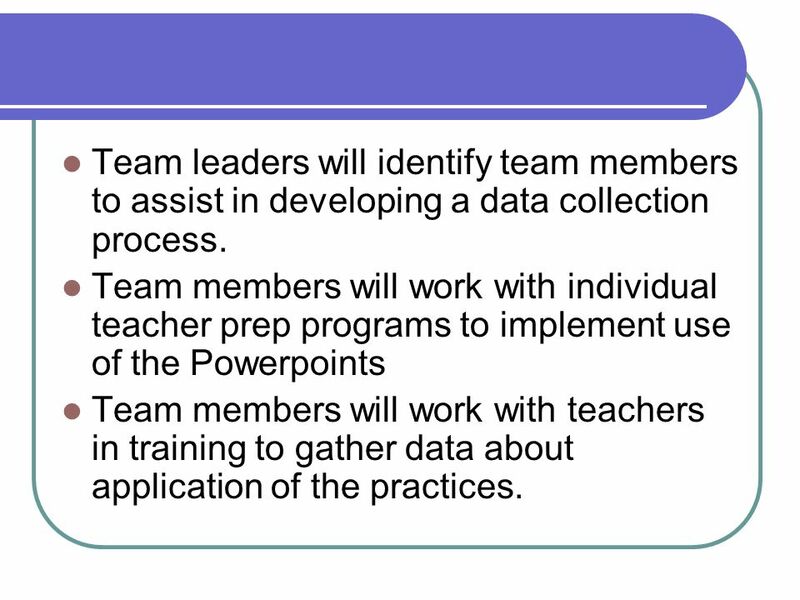 29 Team leaders will identify team members to assist in developing a data collection process. 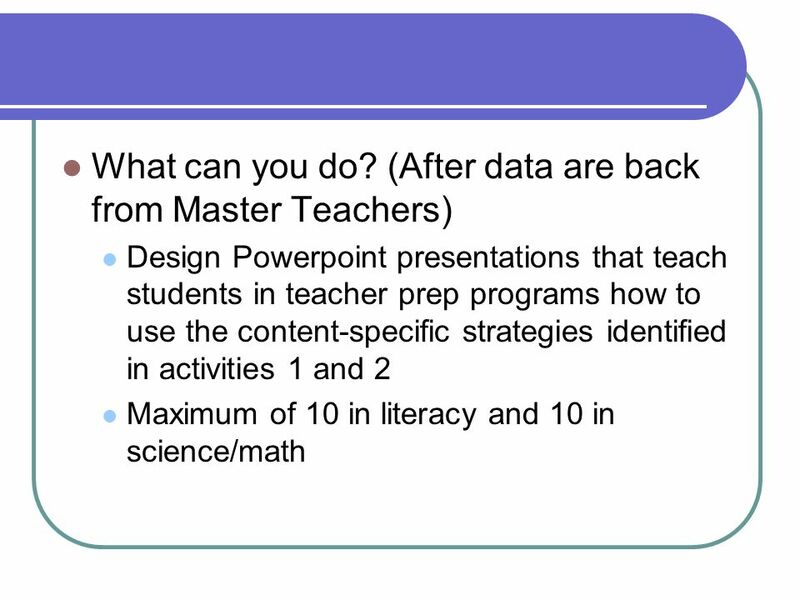 Team members will work with individual teacher prep programs to implement use of the Powerpoints Team members will work with teachers in training to gather data about application of the practices. 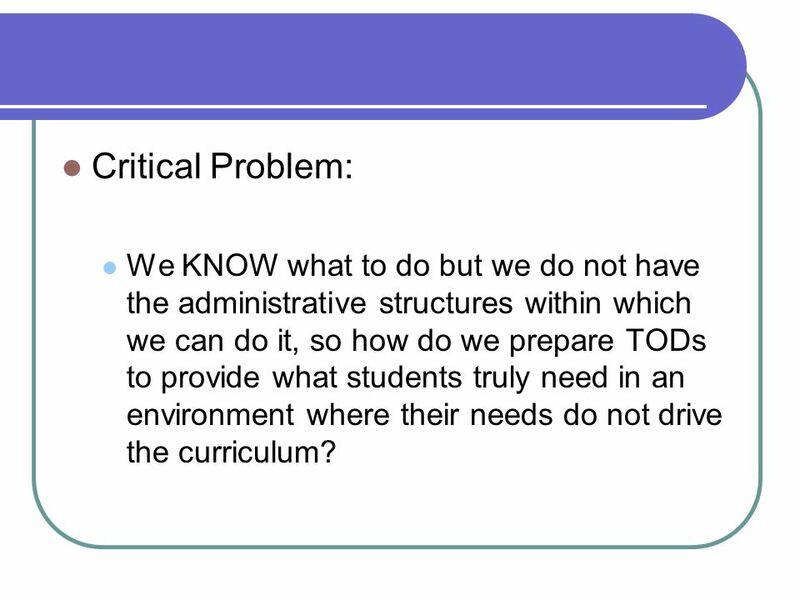 30 Critical Problem: We KNOW what to do but we do not have the administrative structures within which we can do it, so how do we prepare TODs to provide what students truly need in an environment where their needs do not drive the curriculum? 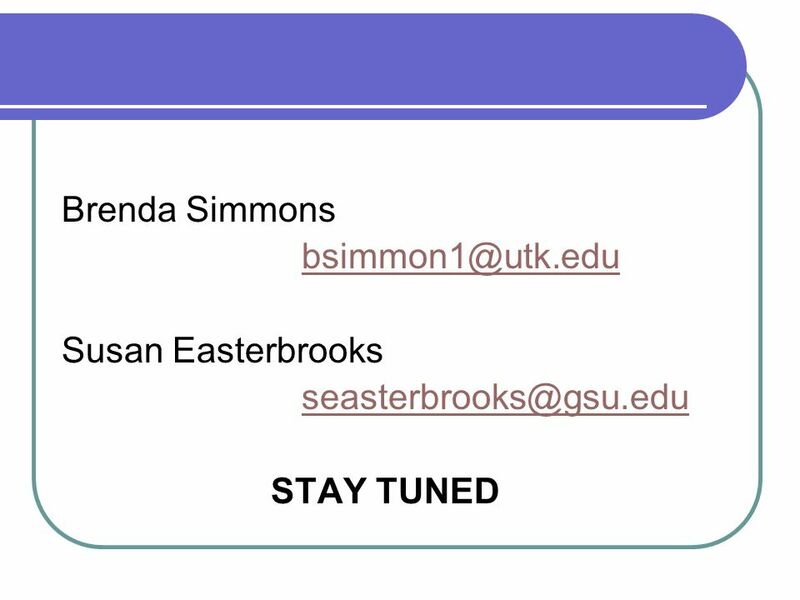 Download ppt "Topical Team 2.2 Academic Content and Content Best Practices October 25 and 27, 2004 Brenda Simmons, University of Tennessee." 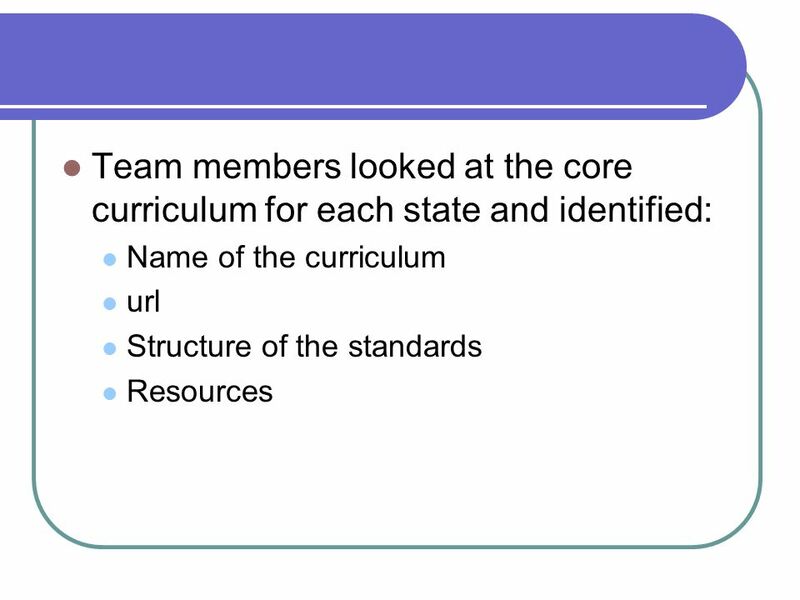 Join Together Project – Objective 2.4 Assessment Competence: Introduction & Overview Sandy Bowen University of Northern Colorado. JOIN TOGETHER OBJECTIVE 1.2 & 2.3 FACULTY COMPETENCE WITH TECHNOLOGY & PROFESSIONAL DEVELOPMENT MASTER TEACHER & PRE-SERVICE TEACHER TECHNOLOGY COMPETENCE. Join Together Advisory Board Evaluation Team Report Donna Mertens Katrina Bledsoe Heidi Holmes Pauline Ginsburg ACE-DHH Conference Denver, Colorado February. Response to Instruction ________________________________ Response To Intervention New Opportunities for Students and Reading Professionals. Educator Effectiveness System November 5, Agenda – Town Hall Meeting Community Builder/Video (OPTIONAL) Today, we will be presenting an overview. The Teacher Preparation World Cafe September 26, 2008 Statewide Meeting Results and Recommendations New York Higher Education Support Center Task Force. Evaluation Capacity Building Identifying and Addressing the Fields Needs. Outcomes 1. 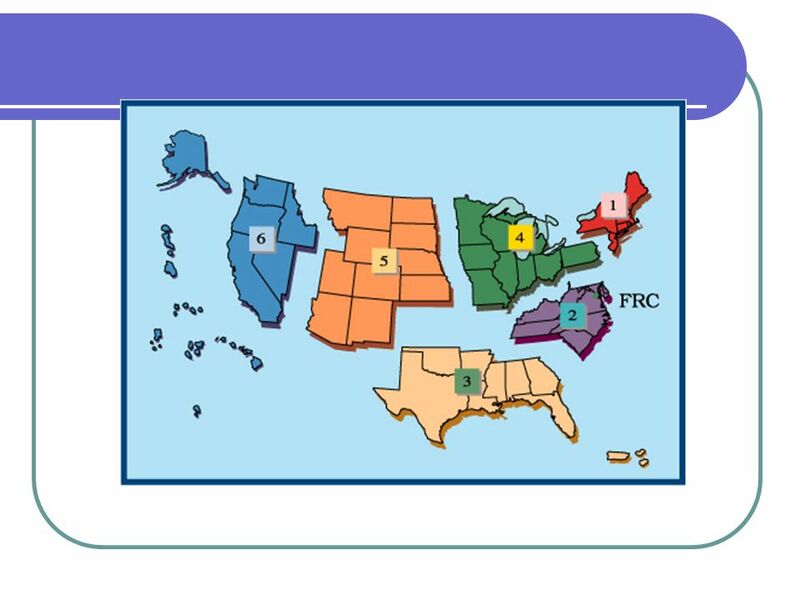 To explore the vertical alignment of the grade-level standards 2. To learn a process that can be used to further explore the standards 2. Author: Brenda Stephenson The University of Tennessee  Date submitted to deafed.net – March 6, 2006 March 6, 2006  To contact the author for permission. Annual Evaluation Some Considerations ems&tl Core Group September 13, 2013. Building Capacity for Effective Co- Teaching EdPower Teacher Institute Summer 2013. Evaluating Competency Based Education in Clinical and Translational Science Wishwa Kapoor, MD, MPH.